Monica Maschak - mmaschak@shawmedia.com Five-year-old Reid Byrdy glances back at his dad while watching the model trains go by on Kishwaukee Valley and Eakin Creek Model Railroad Club's holiday display layout at the Sun City Prairie Lodge in Huntley on Sunday, December 23, 2012. The model railroad display will be open to the public through December 28. 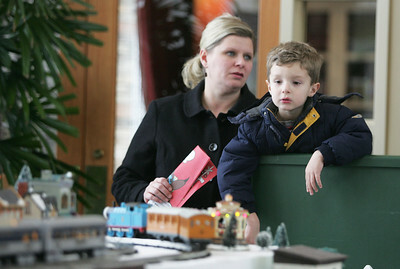 Monica Maschak - mmaschak@shawmedia.com Three-year-old Jack Byrdy watches a model Thomas train whiz by on a holiday display layout made by the Kishwaukee Valley and Eakin Creek Model Railroad Club at the Sun City Prairie Lodge in Huntley on Sunday, December 23, 2012. The model railroad display will be open to the public through December 28. 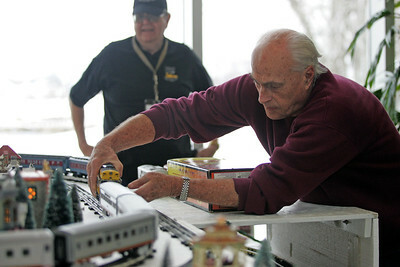 Monica Maschak - mmaschak@shawmedia.com The Kishwaukee Valley and Eakin Creek Model Railroad Club member Alan Schrader changes an engine on a model train to keep the previous engine from getting worn out. The club set up a Holiday Display, free to the public, at the Prairie Lodge of Sun City in Huntley for the Holidays. 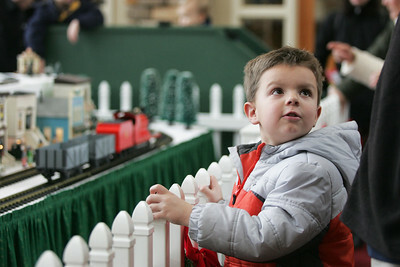 Three-year-old Jack Byrdy watches a model Thomas train whiz by on a holiday display layout made by the Kishwaukee Valley and Eakin Creek Model Railroad Club at the Sun City Prairie Lodge in Huntley on Sunday, December 23, 2012. The model railroad display will be open to the public through December 28.